We’re on to you. We’re not sure just yet what to do about you, how to fight you, but consider this fair warning: We are about to rise up and become David to your Goliath, Frodo to your Sauron, Jean Valjean to your Thenardier. It’s no surprise that Senator Elizabeth Warren struck a chord last week that started a chorus of voices as the Senate voted on a bill to ease regulations on the banks that contributed most to the housing crisis and to cut Pell grants to college students living in poverty. Those two provisions are the noisy gongs, the clanging cymbals that tell us your stony hearts are incapable of love and charity. Yes, wealthy Americans, we are on to you. Yes, some of you quietly give generously to make the world a better place, and for you we are grateful. But when you use your wealth to make puppets of our leaders, you endanger our democracy and our very lives. Democrats don’t like Wall Street bailouts. Republicans don’t like Wall Street bailouts. The American people are disgusted by Wall Street bailouts…. And now we’re watching as Congress passes yet another provision that was written by lobbyists for the biggest recipient of bailout money in the history of this country. And it’s attached to a bill that needs to pass or else the entire federal government will grind to a halt. Think about that kind of power: If a financial institution has become so big and so powerful that it can hold the entire country hostage, that alone is reason enough to break them up. Already you, the 1%, have started the drumbeat of opposition, attacking Warren precisely because she spoke so eloquently for so many of us. Why did the music of her voice give way to a symphony of agreement, even among those who don’t share her political views? Because she sounded an opening note that made even those of us who’ve become discouraged and disengaged to raise our heads and listen—to reach toward our instruments again. Right now we are a ragamuffin street band, making discordant noise as we try to figure out how to play together. And we’re still looking for our David, our Frodo, our Jean Valjean. There’s a reason that those stories have become classics. We human beings are, at our core, a people who want right to triumph over might. 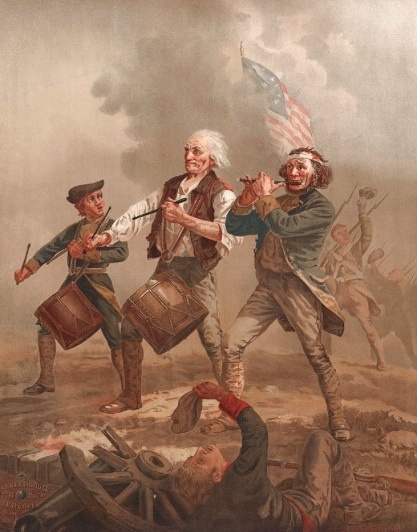 We Americans are, at our foundation, a people who believe that a ragtag army of soldiers, led by an emerging hero and accompanied by a fife and drum, can overcome the wealthiest empire in the world. Words very well spoken. May the the sword you have drawn, slay the very giants that are trying to take over our democracy. You’re going to rise up? Sure. Things are not as clear as you pretend. “A 2007 Treasury Department study bears this out. Nearly 58% of U.S. households in the lowest-income quintile in 1996 moved to a higher level by 2005. The reverse also held true. Of those households that were in the top 1% in income in 1996, more than 57% dropped to a lower-income group by 2005.”_Investors Business Daily.